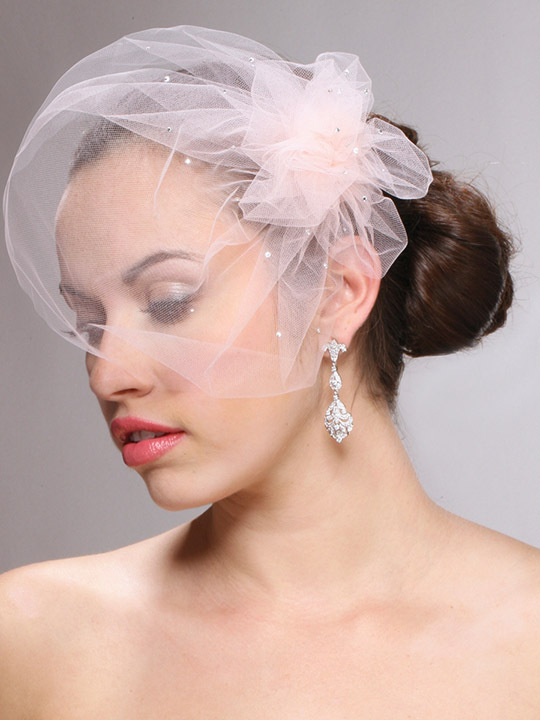 * Mariell's Swarovski Crystal Birdcage Veil is handmade in the USA with the finest quality bridal illusion. * The tulle spans 12" over the head & has a 4" round pouf on one side. * For the bride who loves vintage design but wants it mixed with a more avant-garde wedding headpiece, this versatile bridal cap veil is a must! * For an Avant-garde style, it can be worn on an angle for the couture look of a French wedding hat. * Our visor length birdcage veil has a comb under the pouf and is available in five colors: White, Ivory, Champagne, Peach and Pink Blush.